Sometimes families get so wrapped up in their elder loved one’s health and safety they overlook another equally important detail – their financial decisions. And because aging, with its increased healthcare and medical housing costs is pricey, protecting assets is vitally important. A 2015 report estimated that older Americans lose $36.5 billion annually to financial fraud. Whether the financial fraud is outright criminal or just sneaky and unethical – seniors are often easy targets. A surprising revelation from recent studies shows that cognitively capable seniors are just as much at risk as those who are not. 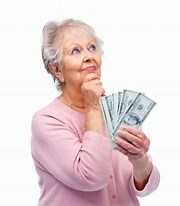 An estimated one out of 18 cognitively competent senior falls prey to a financial scam. Although experts aren’t exactly sure why this is, one common factor stands out — when an elderly person lives alone their financial decisions are more vulnerable to error. Perhaps not having a live-in partner or spouse to act as a “sounding board” contributes to making an unwise or hasty decision. For families — discussing finances with your loved one can sometimes feel like walking into unchartered territory, and your loved one may give you a lot of pushback. However, it’s far better to start that discussion sooner than to wait until there’s a serious problem. Once a lifetime of savings has been drained away, it’s too late. FINANCIAL PLANNER OR RIP-OFF ARTIST? One family’s story… Dave, Martha’s adult son, recently looked at his mother’s investment portfolio and started noticing some red flags. “Hey, mom – do you know exactly what you’re paying your investment counselor in fees and commissions annually?” he asked her. Dave’s conversation left Martha feeling unsettled. Not because she didn’t think it was his business, but because he confirmed something that she hadn’t quite articulated yet to herself. Was her current financial counselor truly acting in her best interests or his own? Martha’s meetings with her certified financial planner always seemed baffling with explanations that escaped her grasp. She attributed it to her own lack of knowledge. However, her distrust began escalating when, following Dave’s advice, she asked him to explain his fees. Surprisingly, he was very defensive during their phone conversation and gave her a sales pitch about his competency and only disclosing his own fee as 1.0% of her portfolio assets. He never revealed the layers of hidden fees stacked within that portfolio or additional commissions for himself that she found out about later. Their next meeting, in person, only deepened her feelings of mistrust when he was overly eager for her to quickly sign onto an annuity (“before the interest rates on this deal drop,” he urged) even though she already an annuity. His explanation about its return on investment and other rules governing it seemed too bulky to grasp. Instead, she turned to wealthy friends for the names of their financial counselors so she could start getting second opinions. Martha chose her new investment counselor based on – his longevity in the business with a well-established firm, his creative approach to working within her own vision, his advice on how to save on fees and commissions, and understandable explanations. Martha was stunned but not altogether surprised. She immediately authorized a transfer of funds to the new company.